Libraries for Life | Kid Reporters' Notebook | Scholastic Inc. In 2010, sisters Danielle and Mika Limcaoco founded "Librery" (lee-breh-ree), a nonprofit organization that creates libraries in places where children don't have access to quality books. "Librery" is a combination of the words library and libre, which means "free" in Filipino. To date, Librery has established libraries in three nonprofit organizations in the Philippines that help children in need. “We started Librery because it was something we knew could make a difference,” says Danielle, 18, who has been running the organization since her 20-year-old sister went off to college in California last year. The girls got the idea from their uncle, who wanted to build libraries around the Philippines but couldn’t because he lived in the United States. “Being an avid reader myself, I decided to make this simple idea come to life.” says Danielle, who is my cousin. 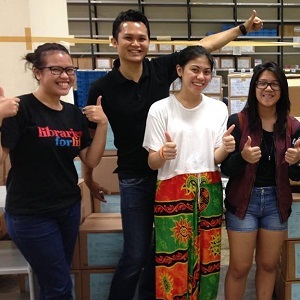 “We hope that our libraries help inspire and foster a love for learning within the children," says Danielle, who is pictured above in a white shirt after receiving a donation from Singapore. She hopes that the students will take advantage of all the resources she has put at their fingertips. This holiday season, Librery is transforming an old minibus into a mobile library that that will bring books to a city near Manila, the capital of the Philippines. “Sometimes, the children around the area cannot afford transportation to a Librery,” says Timmy Limcaoco. Danielle thought that the mobile library would counter this problem by bringing the Librery to them. A senior at the International School Manila, Danielle will be leaving for college next fall. “I hope that the organization will continue on after I go,” she says. “I have a few friends and family members heavily invested in Library, and once I go to college, I hope that they can keep things going. Certainly, I will be working with them via the Internet and will be more hands-on during the breaks!"